Sunder mundriye ho! Tera kaun vicaharaa ho! Sipahee ne mari eet! Sanoo de de lohri te teri jeeve jodi! Wishing all of you a very Happy Lohri! Lohri is the most popular harvest festival of Punjab and it marks the end of the cold chilly winter and welcomes the arrival of spring and New Year. It is believed that Lohri is the longest night of the year. After Lohri, the days become longer and the nights shorter. It is traditional to eat peanuts, gajak (sesame seed brittle), jaggery and moongphali chikki (peanut brittle) on this day. Break the peeled peanuts with your palms. Keep aside. Grease a flat tray/plate with some refined butter (ghee). Keep aside. Heat ghee (refined butter) in a pan on medium flame for 1/2 a minute. Add the jaggery (gud) and allow it to melt (around 7-10 minutes). You can test if it’s ready by placing a drop on a flat surface, if it cools to harden to a brittle consistency then it’s done. Now turn off the flame and add the peanuts and stir well with a spatula till well coated with jaggery (gud). Pour the mixture into the greased tray/plate and spread evenly and smoothen with the back of the spatula to 1/2 inch height. After 5-7 minutes, slice into small squares or any other shape of your choice. 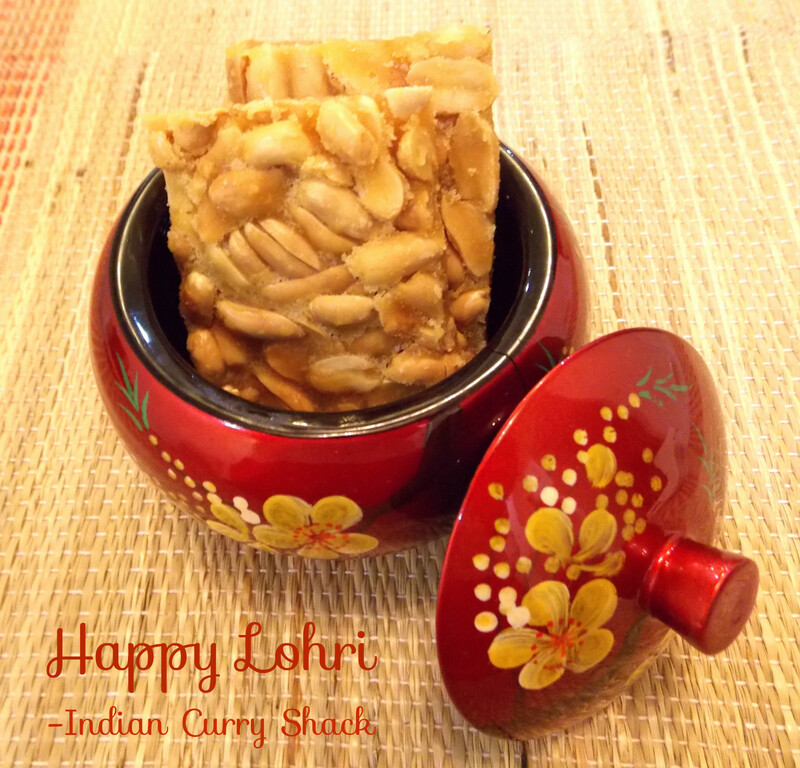 Allow it to cool well and then enjoy the delicious Moongphali Chikki (Peanut Brittle). You can store the Moongphali Chikki (Peanut Brittle) for a few days in an airtight container and relish it.